It was a Friday and I had official work, out of the office. The work got over by 4 pm and that was a perfect timing to venture to any beach within the city and watch the sunset. I and my colleagues decided on Queen’s Necklace aka Marine Drive. 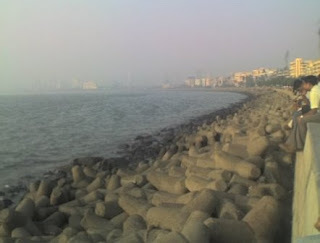 Marine Drive is the 3 km seaside road in Mumbai City that connects Nariman Point and Babulnath. It’s a curved concrete road which has a natural bay on the sea side. We went to the part of the beach near the Churchgate station. Chawpatti beach is in one end of the road. We could have gone there, but decided to stay here, to facilitate easier return via train. It has beautiful short wall beside which is filled with people waiting to enjoy a beautiful, peaceful sunset. We sat there on the wall and that was such a beautiful experience. With my crush for secluded beaches, a beach like this one in the midst of the city was rather different experience. 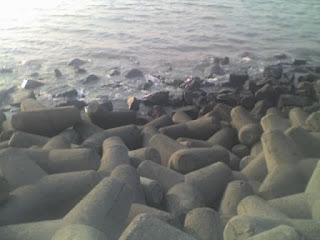 The seaside of the wall has several concrete rocks to prevent the waves from splashing in. There were quite a few eagles sitting on the rocks deeper in the sea. There were these playful kittens which tried their hand in jumping from one rock to another and playing and their mother trying its level best to control and take care of them. Watching them play, I didn’t know when the dusk began. This is also called a Queen’s Necklace as it appears like chocker or a close-neck necklace of pearls and shining stones when seen from any of the sky scrapers beside, at night. Thanks to the street lights and buzzing traffic in this curved bay road for this exquisite visual treat. We watched the beautiful dusk and started off back. Little did I know something else was waiting for me there! Reaching hostel, I had dinner and almost retired for the day at around 9:30 pm when my roommates said, “Let’s go to Juhu Beach.”. I was like “At this point of time…!!!”. Well, it was esp. for me and another floor-mate (well, that’s a word I coined for someone who lives in the same floor but in a diff room in hostel. When there could be class mate, school mate, roommate, block mate, etc etc etc, why not a floor mate!). We both were leaving the hostel within a few days, coz I had a change of job and she had a change of life, hmmm.., well, she was getting married. So, the plan was to have a hens’ party. She was in an absolute celebration mood with her marriage on cards, and wanted to sport a sari. But didn’t know to drape it. She tried but errrr forget it. I extended my helping hand and she got ready, clad in sari. We had to get out of hostel before 10 pm as per the rules. After 10 we weren’t allowed to go out. So hurriedly we got out and looked for an auto. 6 of us in 2 autos, we were off to Juhu Beach. No complaints about the timings, Juhu beach was crowded and had at least a few hundred people even at that point of time. I had a second dinner with Mumbai specialty chats and a veg biriyani, a Juhu beach speciality. 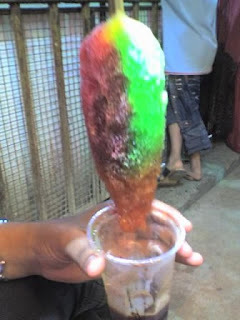 We had ice gola – it’s essentially a stick with crushed ice lollipop on it with colorful sugar juices and essences poured all over it. The essence and color are our choice and a friend opted for a multi color one. This is also a Mumbai Specialty. After treating our tongues and stomach’s well, we went and sat on the beach and enjoyed the splashing waves and night. This was such an amazing view to see the black waves bordered with ripples of white bubbles crashing on to the land, topped with a cool breeze, a dark night, and friends together. It was 11:30 pm. The vendors were still on. Families were relaxing. Some kids playing and some kids sleeping onto mom’s lap. Groups of friends enjoying just like us. Couples cozying. The crowd was not overwhelming and it was not a solitude feel, as that would feel rather scary at night. The whole thing was perfect. The police patrol vehicle was beside to take care of the citizens. It was my first trip to the beach at dead night and it was great. Astounding, incredible, wonderful feel it was. A local photographer was walking by and asking people if they needed their pics to be clicked in the beach. We so badly wanted, as we were parting in the next few days. We had a nice pic and ordered for 6 copies which would be given to us in half-an –hour. Of course, he had to bargain for a good deal. It was 1 am when the crowd started to dissolve little by little and we too decided to get back. Took 2 autos as before and returned back and didn’t get to sleep for the next half-an-hour and kept on chit chatting and finally slept off. Walkable distance to beach from all stations. From Dadar: 10 km via Mahim, SV Rd, Khar, Juhu Rd. From Andheri: 6 km via SV Rd, Hasmukh Ngr, Juhu Rd. Ah Mumbai never sleeps! I've not been on Juhu Beach in decades. Last time I drove past and event that was 10 years ago. I remember the chats we used to eat at the beach in the evenings and enjoy a walk when the sun sets. Brought back some memories of my early trips 20 years back! Ah to be young again and enjoy the beach at night. I remeber doing that years ago. It is especially nice on hot nights. You have a lovelybunch of friends I hope you keep in touch when you all leave. Very nice indeed. Thank you for the specila mention of my blog. I'm flattered for this! THANK YOU! Will remember that, place I always wanted to go. Dusk is a beautiful time to be at such a place.. The shots of the beach and rocks near the sea has come very well. Having been there myself, I have enjoyed the place. I have voted for you at blogger choice. Thanks for the tour! It was great seeing your area of the world. KoOL looking pictures! Could you see these places on the high tide day? Lovely pics and I really wondered about ice gola.. Thanks dear.. :) Long time no C... Enga poninga...???!!!!! Yes of course, U can very much see this place on a high tide day unlike Haji Ali which gets covered by water completely. Queens Necklace is one of the major roads in Mumbai and is buzzing with traffic 24x7. 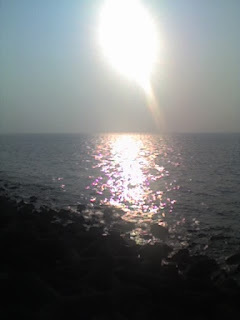 Marine drive has always remaines as romantic as ever...some lovely pics there! Thanks for dropping by and commenting. Do drop in often. Would love your frequent visits and comments and followups. Thanks for giving me the opportunity to visit your blog. You have some interesting photographs of your travels and your sketching is excellent. It was great fun to see the black waves bordered with white creamy lather. Loved that trip. Are you kidding. I am so glad and happy about your visit to my blog. Thanks for dropping by and commenting. So glad that you like my pics and sketches. Do drop in often dear. WOuld love your visits, comments and followups. Looks like a great reunion at Mumbai. Marine Drive/Queens Necklace is a charmimg place especially at night.Did you happen to look down at Marine Drive from the top of Malabar Hill/Hanging Gardens ? 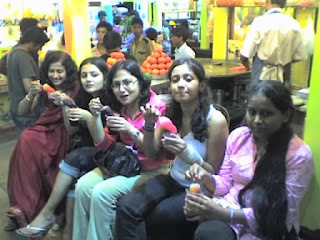 Your Juhu jaunt was fab.I liked the pic of your group lapping up the colorful juicy ice golas at night. You all certainly painted Mumbai red ! Vaibhav Says: You are a great writer or a good blogger. You should try your hand at writing for publications or nature houses.You will do well. The detail and words used in this blog make you stick to it and read it. Good one. It was not a re union. It was something like a farewell. We parted after this meet. 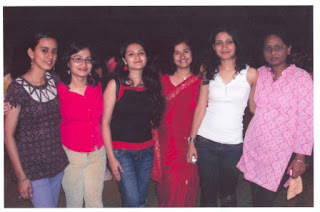 Glad u liked our hostel spl in my blog. I loved that day with u guys.. Thanks a lot for dropping by and commenting.. Writing in publications is something I've given a thought of. What a joyous adventure in the city of dreams. Truly enjoyable. I am also in love with beaches,i have never visited a beach such late would like to see how it goes sometime in the future. I have a doubt you said that your hostel doesn't allow you go out after 10 pm but how come they allow you in after 1 am funny rule. A person can get out at 9 hrs.59 min.59 sec pm and return whenever they want. This loop hole needs to be shut. Visitng beach at dead night, is a must atleast once in lifetime. And many come back after work and change to party wear and then leave to disco or clubs or dinner or date.. To accomodate all these is this timigs. Very very nice post, very inspiring story and pictures...Best wishes to your friend who's getting married and good luck on your new job. I understand that ma. But why that 10 pm restriction take that off too. I have been trying to vote for you for a long time but when I type my email ID and pass word nothing is happening. I tried several times. I don't know what is the problem. I'll keep trying till my vote goes through. Your visit to Bombay beach and the excellent narration is extremely good. This is a very interesting post. You were supposed to return to your room by 10pm but you came back only at 1am and I suppose the care taker did not complain because it was a special occasion. Your photos are wonderful and captures the special moments very beautifully. When I was posted in Goa I used to go to Bombay by ship for official meetings. It took almost 24 hours by sea. I remember going to Chawpatty beach in the night and having small colorful ice creams of different flavors. Well, that was long, long time ago. Thanks Sir, for trying to vote. Hopw ur vote would get thru..
No No. We weren;t supposed to return by 10. We were supposed to get out by 10. After 10 going out is not allowed. Late night return allows us to return back by 1. But that is recorded. Only 4 or 5 late night returns are allowes per month. Normal return time is till 11 only. Mitr, you have a lovely blog. P.S : thanks for dropping by at my blog and for the comments. I'm craving for Bombay now :( We are quite close to her, though. Thanks for directing me here.